Pet rabbits love to dig and chew. In order to protect your house rabbit as well as your home you’ll need to bunny proof. We’ll show you how. Wires are one of the main targets of bunnies. Their sharp teeth can slice through your wires quickly, damaging your favorite lamp or worse, electrocuting your rabbit. It is best to cover wires with hard plastic sleeves or flex tubing. These can be purchased at any hardware, home improvement or electronics store. Even better is to keep all wires out of the reach of your bunnies. You can also use large flex tubing to protect wooden table or chair legs. Baseboards and moldings are also frequently chewed by bunnies. You can protect your baseboards by covering them with plastic guards, 2x4s or furring strips found at your local hardware store. We decided to protect the elaborate moldings in our Victorian house with wood panels attached via velcro strips. 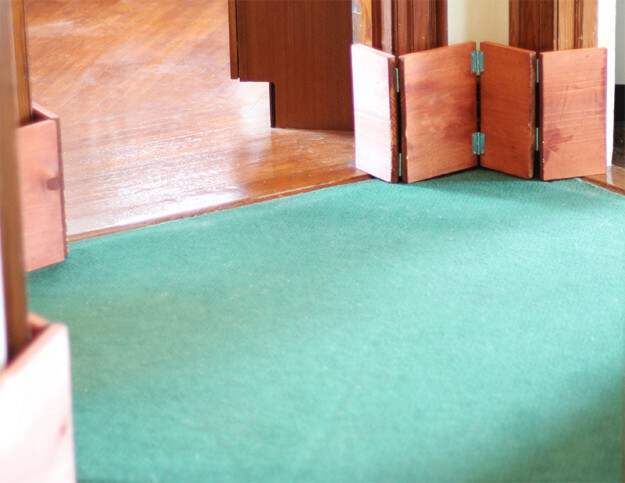 We talk about this solution in our blog post, Adventures in Bunny Proofing: Baseboard Protection. 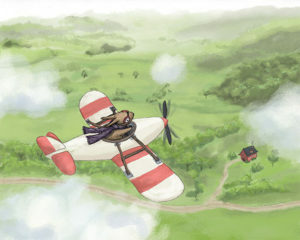 When you look around the area your bunny will be residing in, do you see any places you don’t want your bunny? Some bunnies can jump 36 inches or higher, and their curiosity brings them on top of shelves, chairs and desks. They are also quite adept at squeezing into tight spaces, like behind your bookshelf or under your bed. You’ll need to block off these areas. You can use baby gates or puppy pens to block off sections or whole rooms, but ideally they should be made of metal, otherwise your bunny will chew his/her way through quite quickly. Watch out that the slats aren’t too far apart, however, or else your rabbit will slip right through. 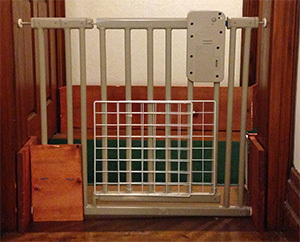 If the slats are too far apart (which is often the case with baby gates), you can zip tie storage cube panels or wood panels to the bottom. Bunnies are natural diggers and will dig anywhere they can, especially on your carpets. Any loose edges will be pulled and dug on until your carpet becomes a stringy mess. Tiles or untreated sea grass mats are good ways to cover areas that your bunny likes to chew. 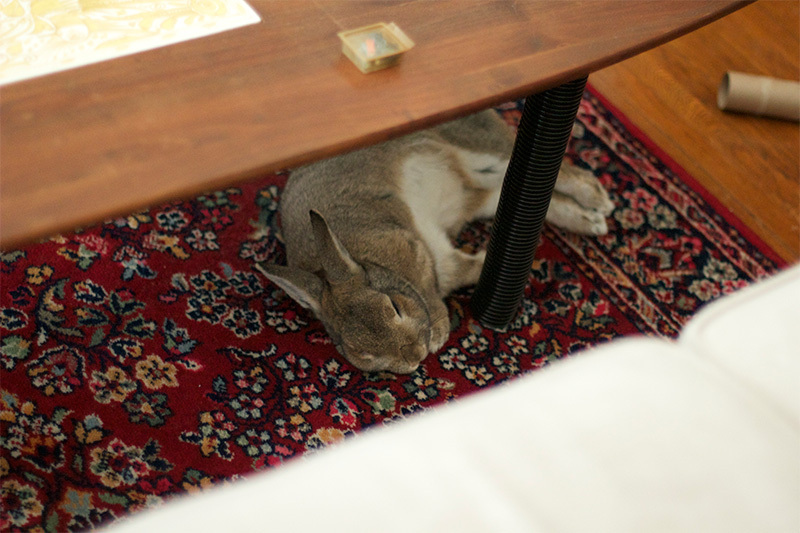 You can also arrange your furniture to cover spots your bunny frequently digs. Houseplants can be dangerous to bunnies. Many plants are toxic to your bunny, and contrary to popular belief, domesticated rabbits don’t always know by instinct not to eat these plants. It is best to keep any plants out of the reach of your bunny. Poinsettia, holly, tomato leaves, and tulips are among the plants toxic to your bunnies. For a more information, see the Sacramento House Rabbit Society’s list of poisonous plants. Providing many toys can also help dissuade your rabbit from chewing on your belongings; when your bunny is occupied he/she will be less inclined to be destructive. See our article, Enrichment for Your Pet Bunny for more ideas about providing interesting, and acceptable items to chew. By bunny proofing your house, you’ll provide a safe environment for your rabbit and protect your belongings. This will make both you and your bunny very happy.